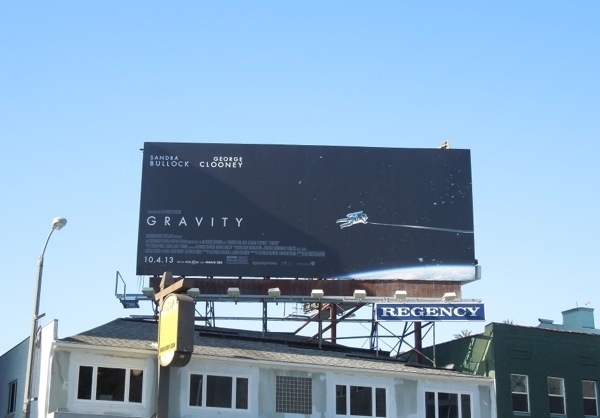 The advantage of having two permanent prominent billboards close to each other in this prime location along Sunset Strip like Warner Bros. Studios does, is that you can do some clever ad creatives like this duo for their forthcoming sci-fi movie, Gravity. 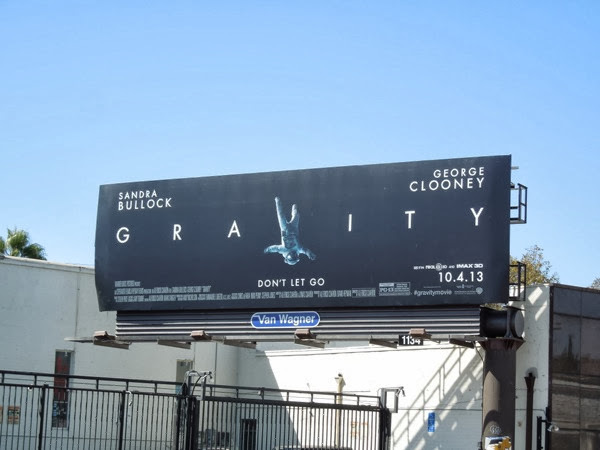 Alfonso Cuarón's science fiction drama starring Sandra Bullock and George Clooney isn't out until October 4, 2013, but this intriguing and dramatic 'Don't let go' creative certainly conveys the sense of peril the astronauts find themselves in when an accident leaves them adrift in space. 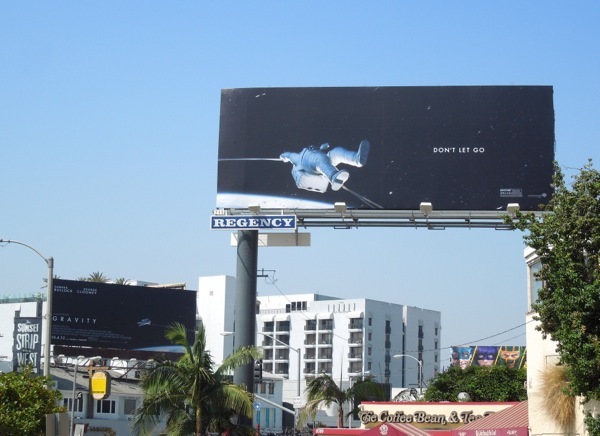 Having one astronaut on the billboard hoarding on the left and the other dangling by a spaceline on the billboard to your right makes for an excellent visual and absolutely captures your imagination. The Children of Men director's new film, written with his son, should be pretty atmospheric and intense viewing too, as it looks like Bullock's medical engineer 'Dr. 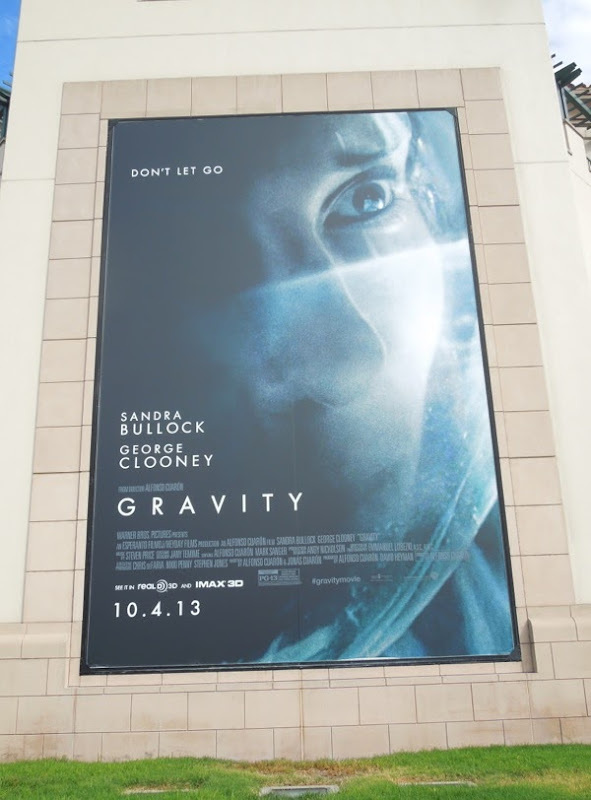 Ryan Stone' and Clooney's veteran astronaut 'Matt Kowalsky' are the only cast members in the movie. 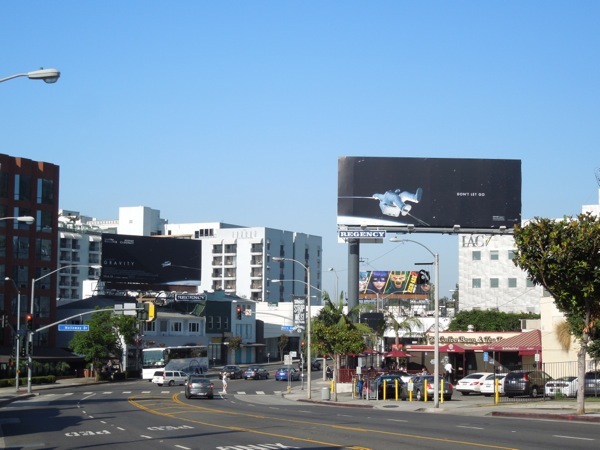 These compelling twin billboard creatives were snapped along Sunset Boulevard at Holloway Drive on August 12, 2013. 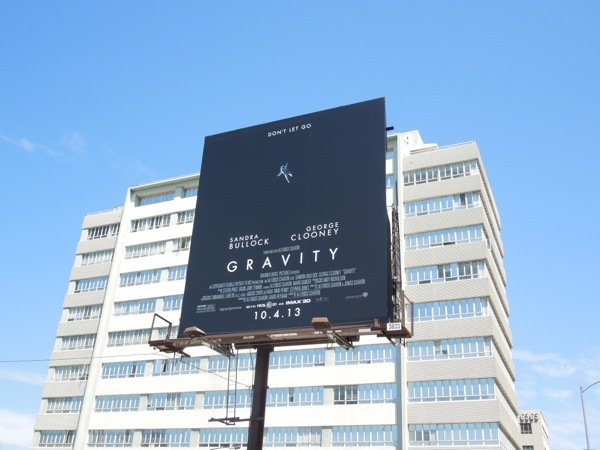 Let's hope the film will be as interesting as the ads when it's released. 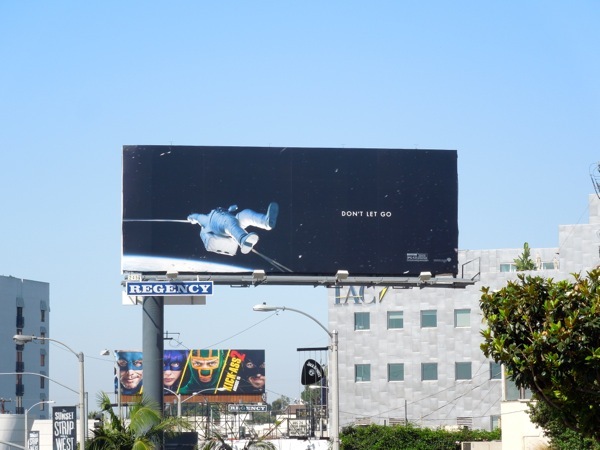 For another astronaut-themed billboard, be sure to take a look at this funny billboard for Adult Swim's Newsreaders TV Show. 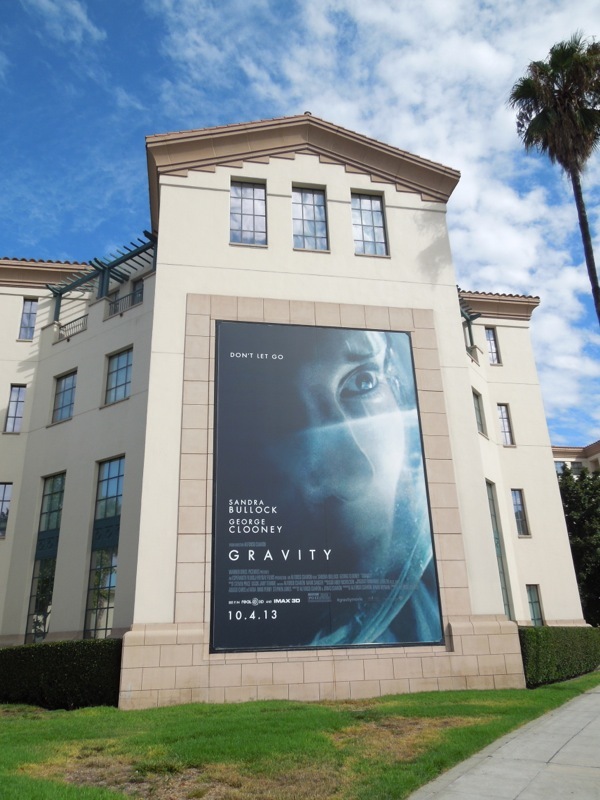 UPDATED: Here's another very cool and apt creative for the new space-based movie, Gravity, spotted orbiting Wilshire Boulevard on August 22, 2013. 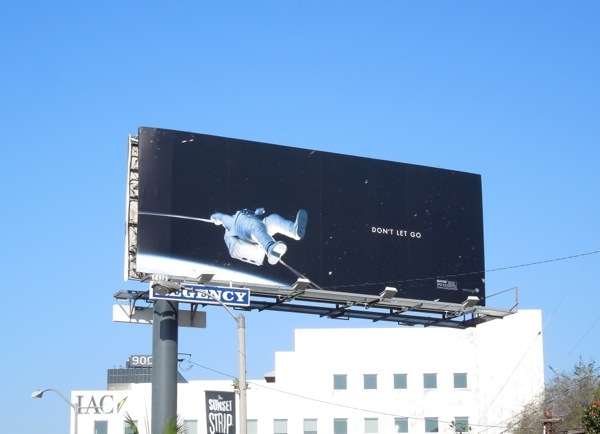 Remember in space no one can hear you scream, so really, 'Don't let go'. UPDATED: Now here's another space-based creative that cleverly evokes that strong female lead/Sigourney Weaver in an astronaut suit Alien feel. 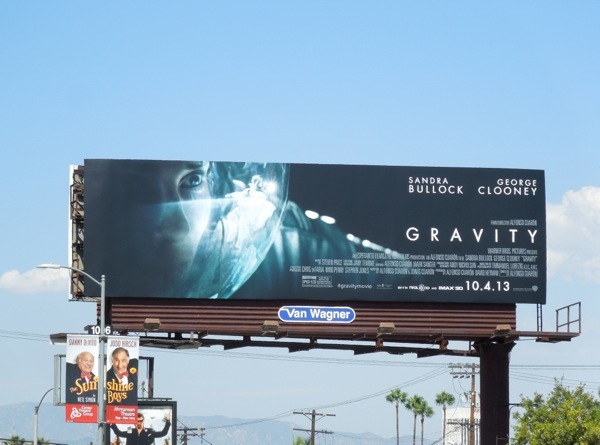 This evocative Sandra Bullock focused billboard was spotted at Warner Bros. Studios in Burbank, California on August 31, 2013. 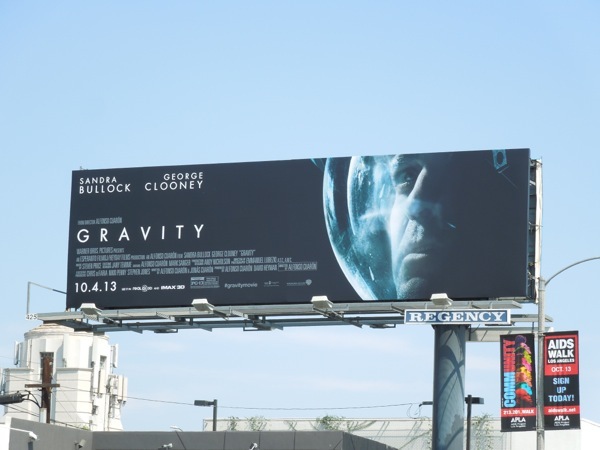 Plus this standard landscape version of the same billboard shows there's an astronaut, George Clooney presumably, reflected in her helmet faceplate. 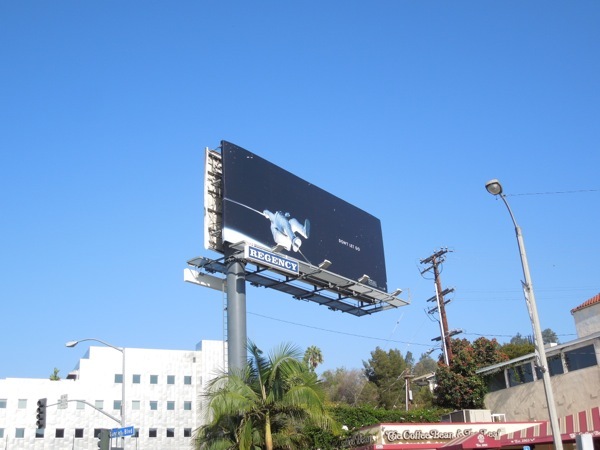 This cool billboard was snapped along La Cienega Boulevard on September 7, 2013. 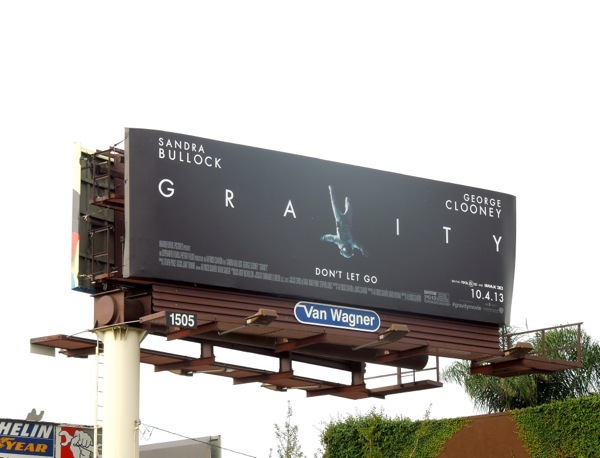 UPDATED: This new ad creative that Daily Billboard spied along Highland Avenue on September 10, 2013 is quite possibly a new favourite for the movie, with the legs of an upside down astronaut taking the place of the 'v' in Gravity. Very clever and eye-catching. 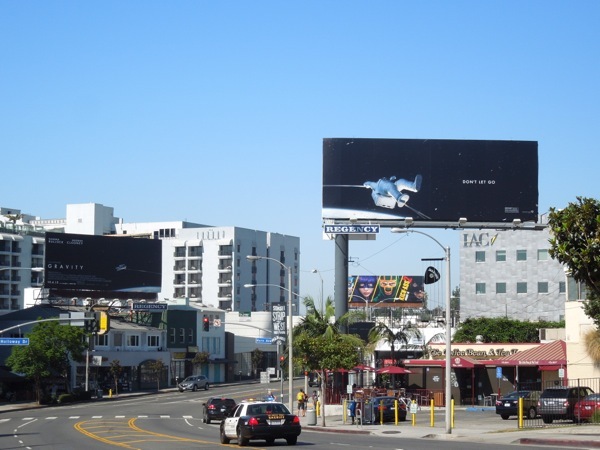 And finally, here's a billboard featuring George Clooney himself in his astronaut helmet, spied along Melrose Avenue on September 11, 2013. 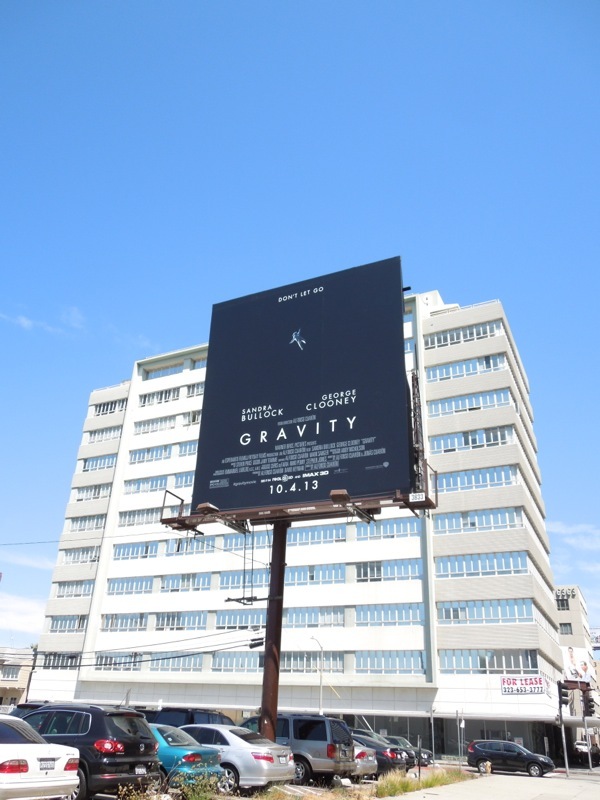 UPDATED: Daily Billboard managed to spy another of the Gravity billboards with the astronaut as the 'v' in the film's title along Beverly Boulevard on a much sunnier September 22, 2013. UPDATED: Congratulations to Gravity's director Alfonso Cuarón for winning the prestigious Golden Globe for Best Director Motion Picture at the 71st annual awards ceremony. 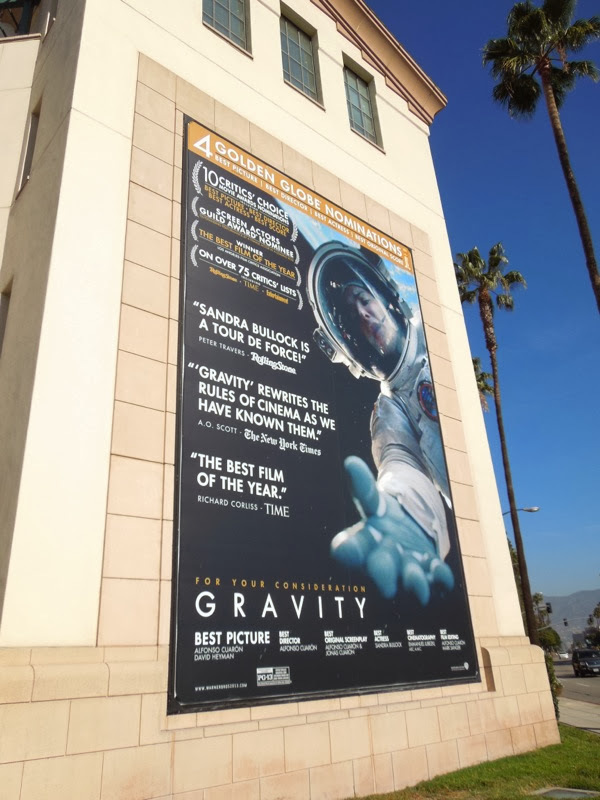 Here's a Golden Globe nomination billboard for the movie snapped at Warner Bros. Studios in Burbank, California on January 11, 2014. 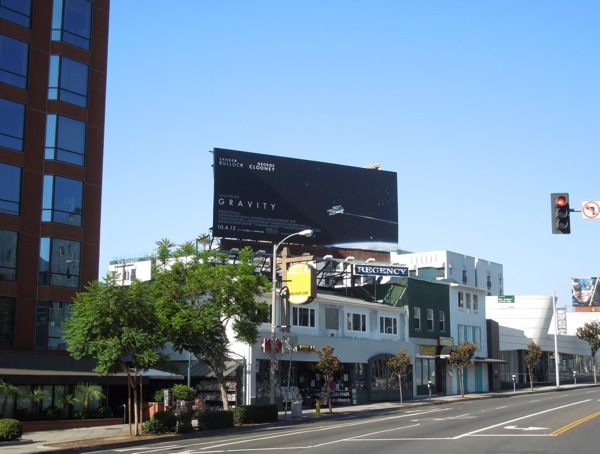 Like the post says, Sunset Strip in L.A.